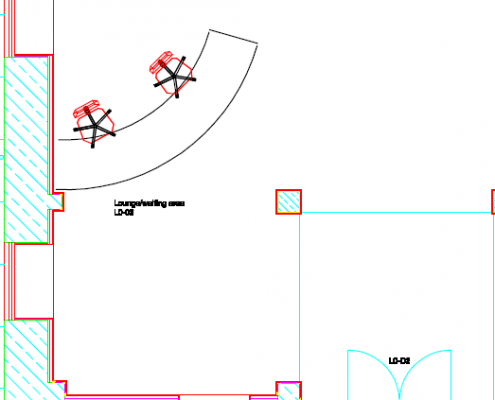 Reception Area Planning | How can I plan my reception area? 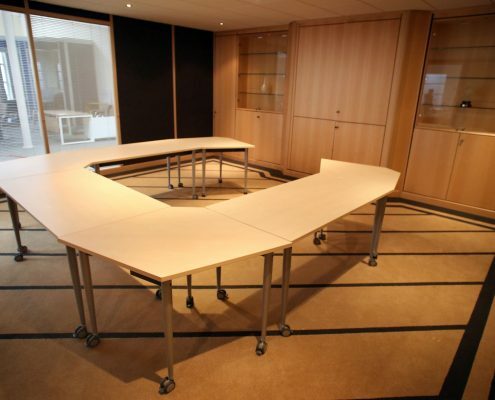 We can! 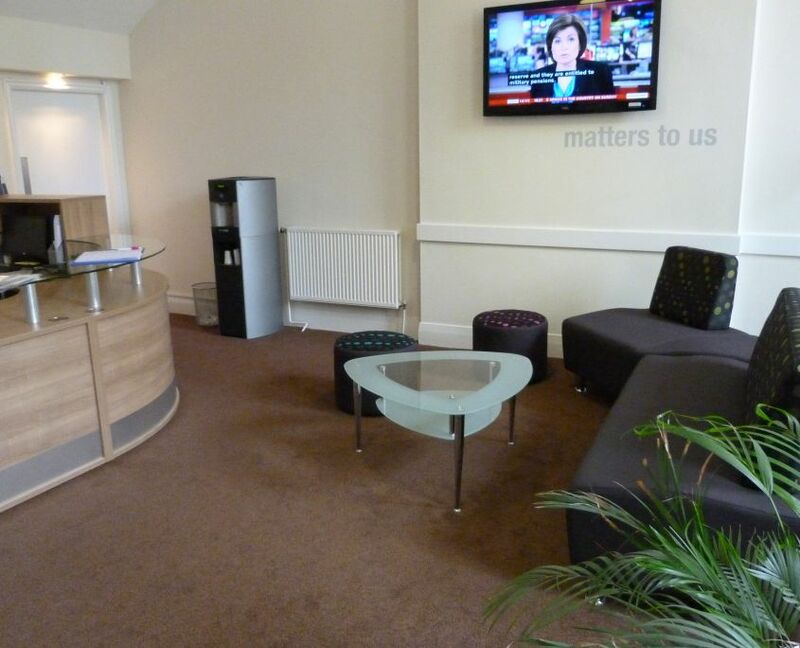 Reception area planning – How can I plan my reception area? 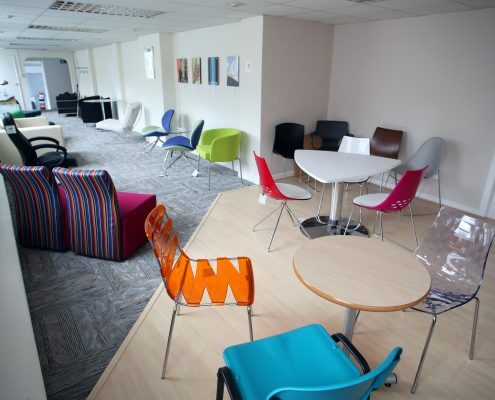 We can! 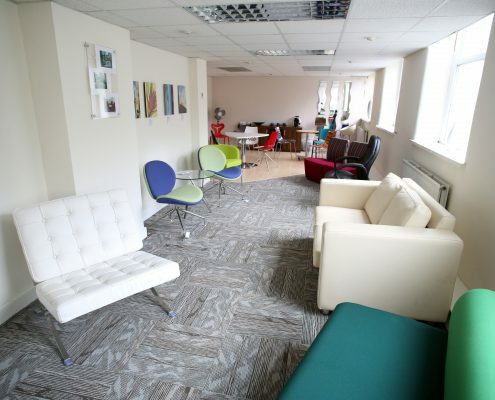 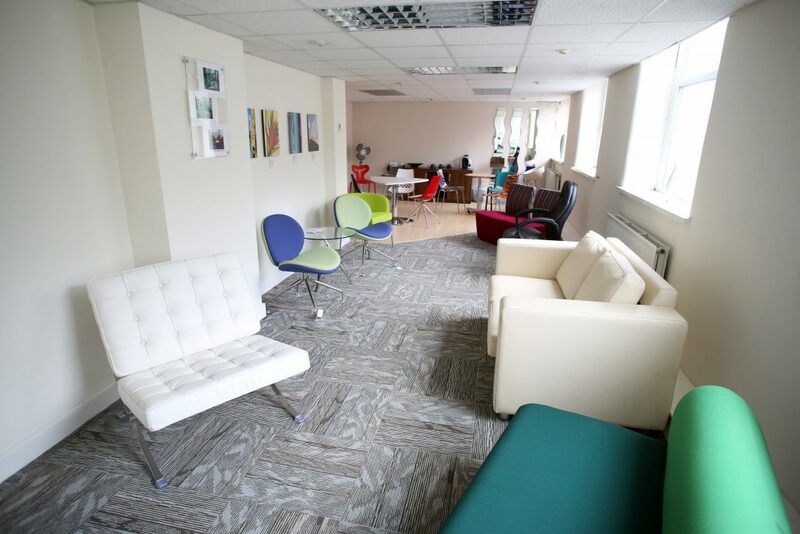 Planning any area of the office can seem daunting especially reception area planning as it is your first impression and you want it to be a good one but dont worry, Bevlan Office Interiors can help! 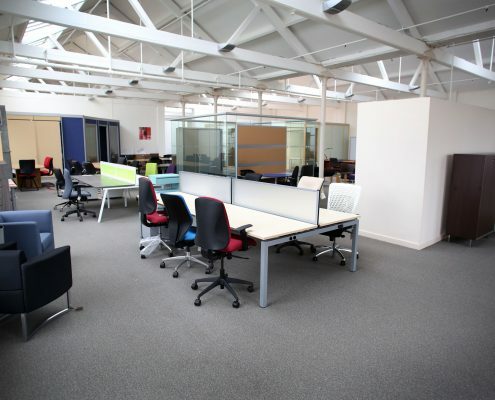 At Bevlan we offer office space planning either as a standalone service or as part of a refurbishment or relocation project. 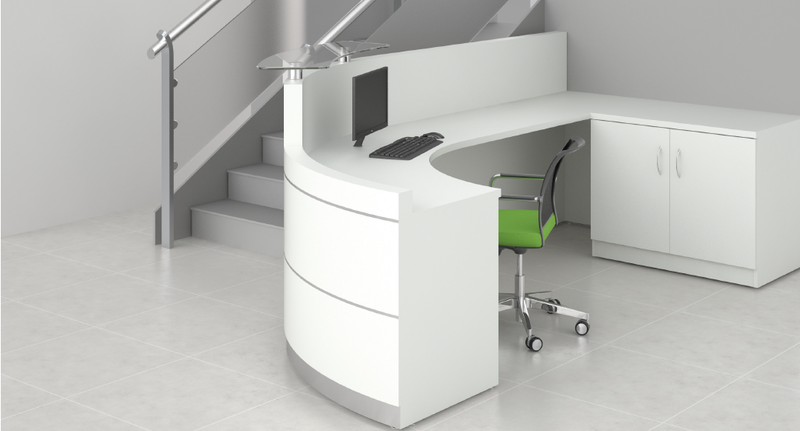 The reception area planning analysis we carry out will take a look at your office workspace, workflow, office storage, office furniture requirements, the number of people you need to accommodate within the reception area space and your plans for future expansion – very important. 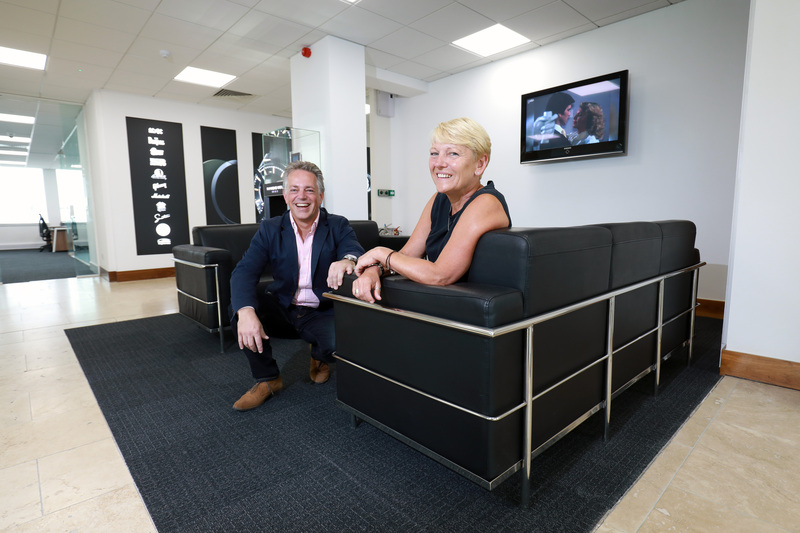 Our experienced sales and interior design specialists can offer a free one to one service where we will come and give you our time to make sure you get what you need. 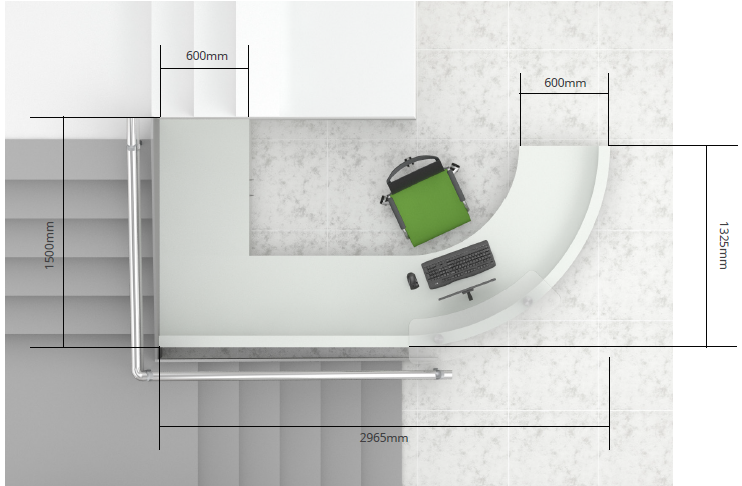 Undertaking a detailed reception area planning analysis will enable us to offer advice and suggestions on design, layout, furniture, lighting and flooring and how to maximise the available space. 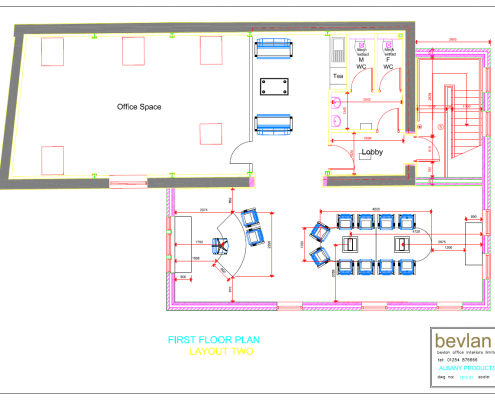 Once we have assessed your reception area space we can then get to work on our free CAD drawings that we use to help the customer visualise their new office space. 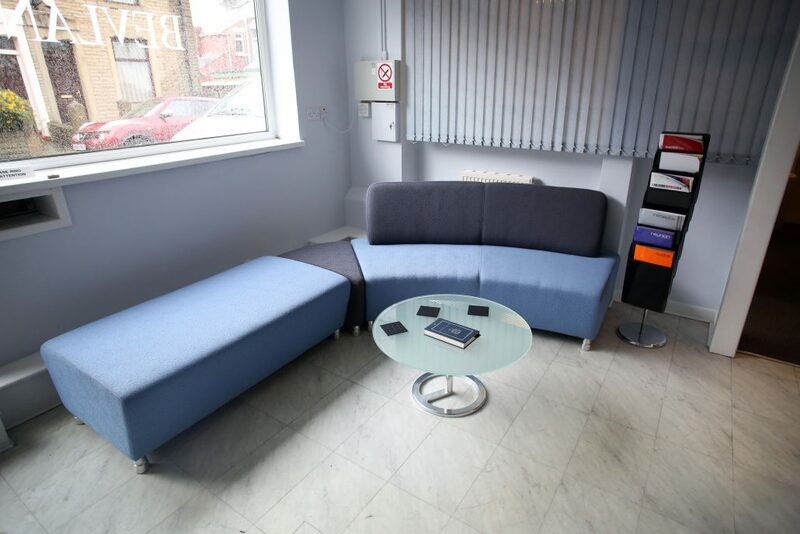 We will fit in what you need for the individual employees that will be using the reception area including storage, space and more. 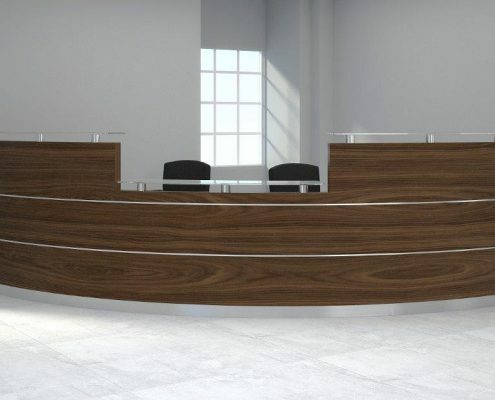 You will be able to see at first glance how your reception area will look and how the reception desk with all it’s amentities will appear. 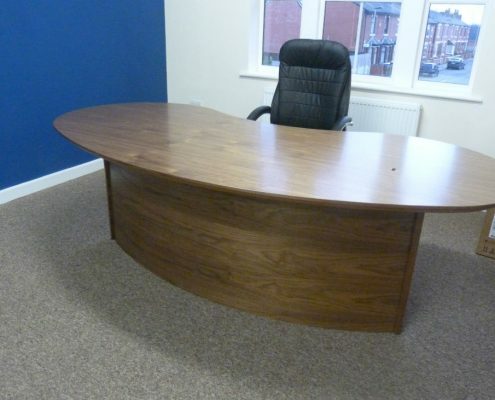 This can also be amended to what you want but we will advise how it will fit efficiently. 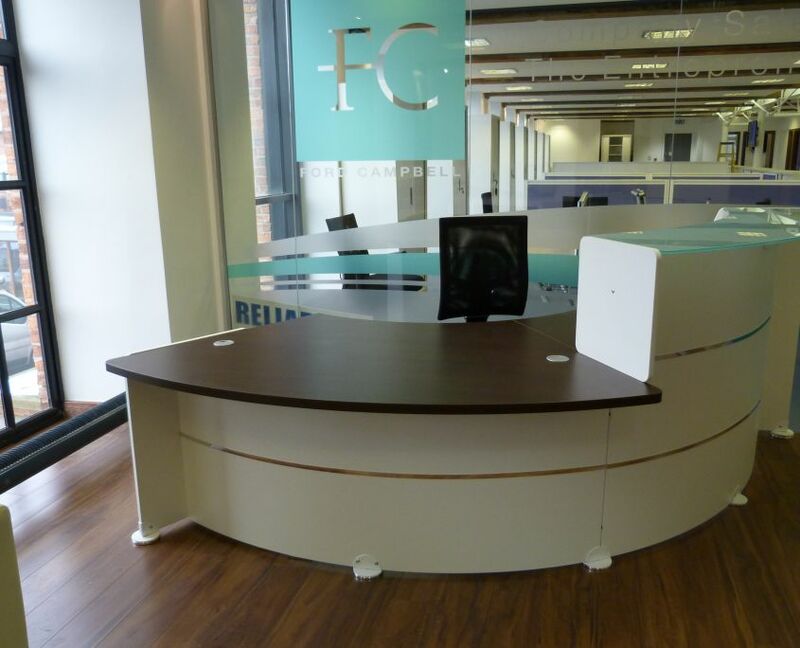 We will often show you various ways you could fit the furniture in making sure to fit the space available, giving options of bespoke made reception aras or standard reception areas. 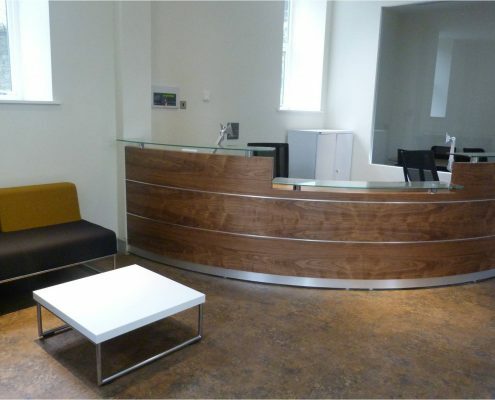 In this service we also offer renders of the reception in place to give an even stronger visual of how it will look. 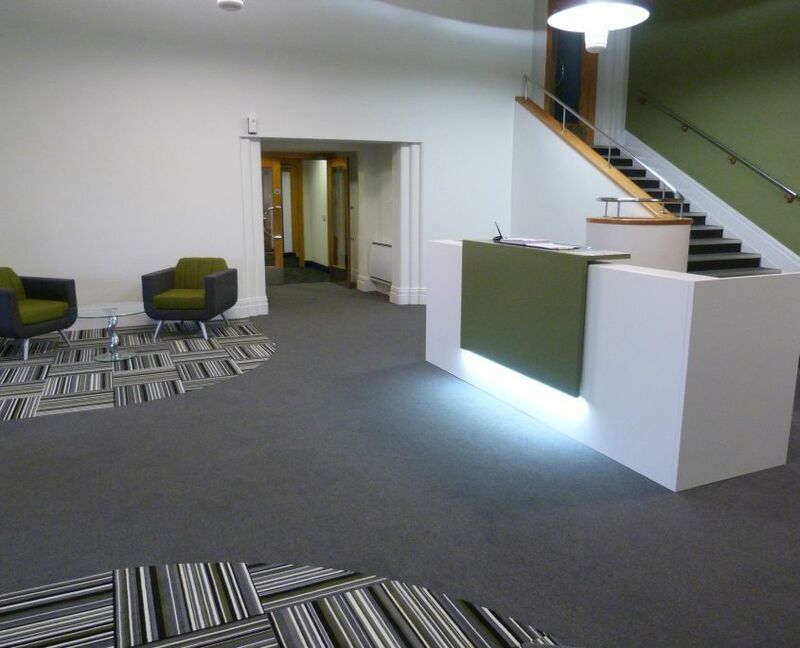 As you can see from the pictures of an example reception area we have planned on the right, it can be shown from different angles. 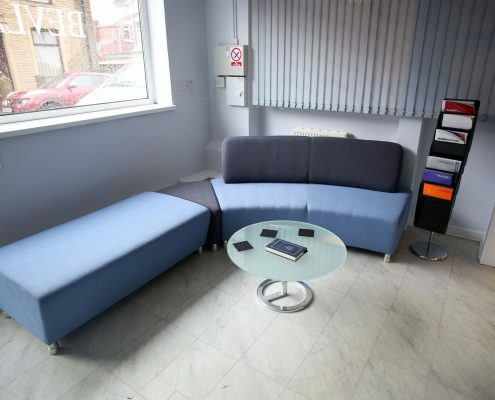 This particular reception area is extremely small and it is still possible to have a reception area bespoke made in there, this is exactly how we step in and help you visualise what can be done in spaces, as our strap sign says we look at space differently for the positive. 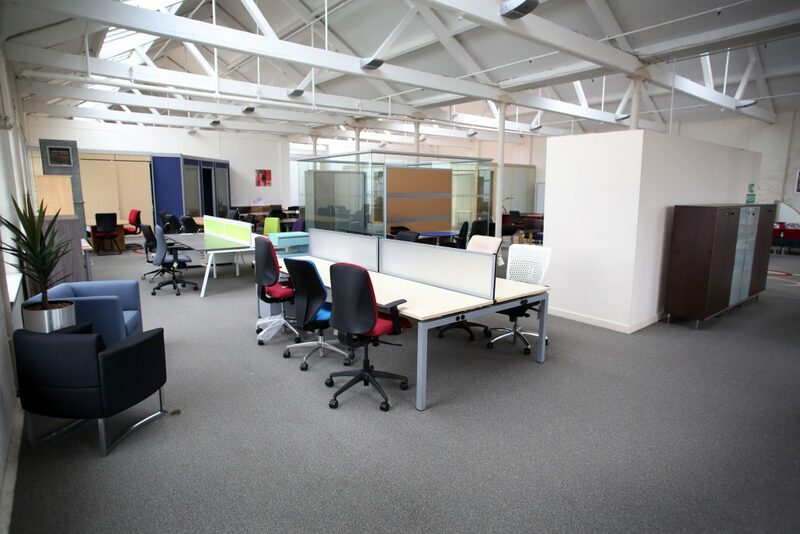 We have worked with many clients over the 30 years experience of our team, and have seen many office environments that need space planning. 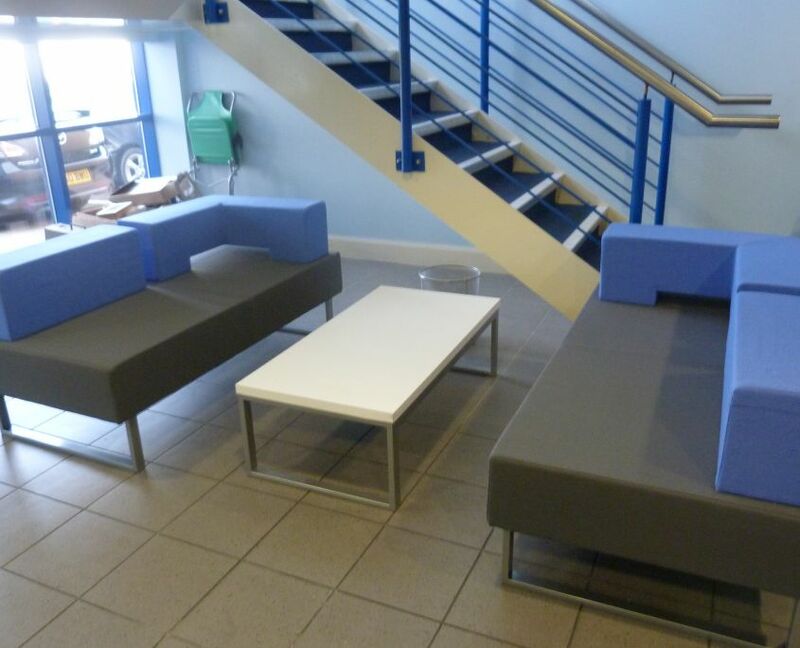 We understand what fits, what utilises space and what doesn’t. 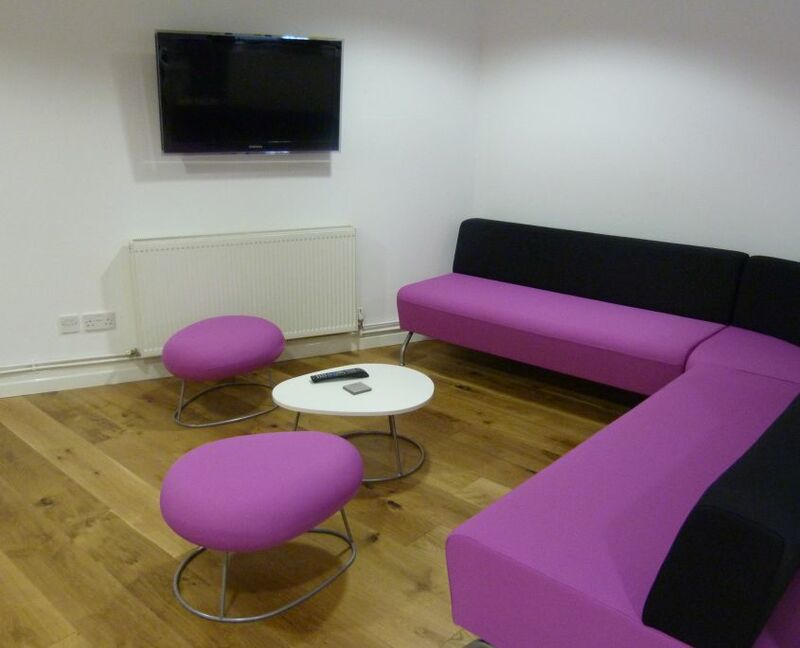 So with all this information and knowledge we can promise a positive and successful project at the end. 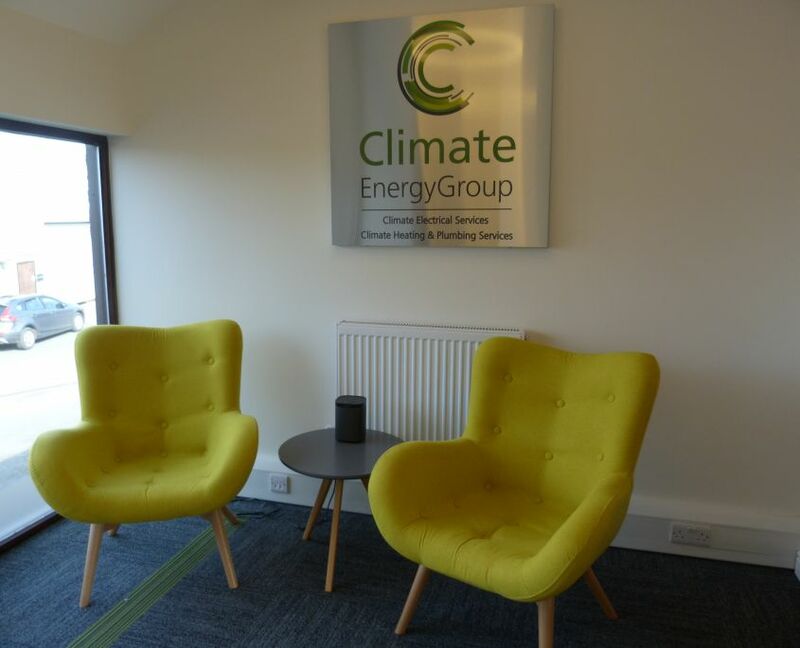 We pride on our excellent customer service and we let our customers do the talking for us with the amount of positive testimonials. 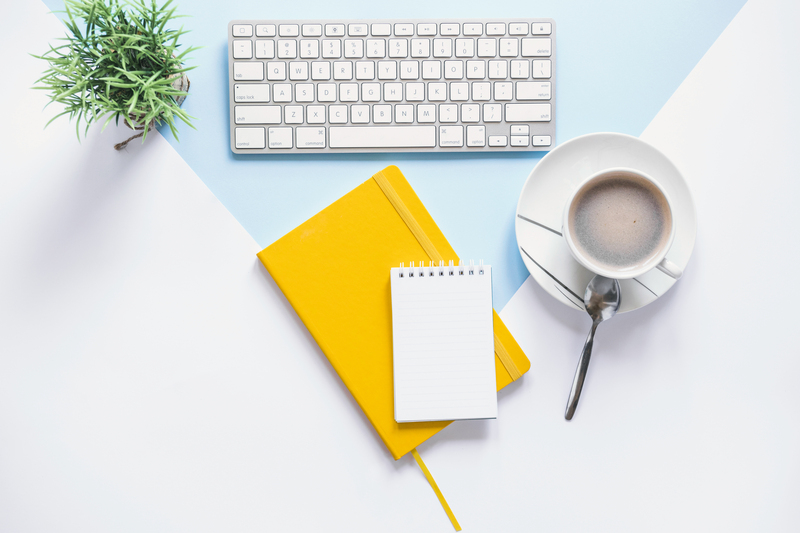 Take a look on our testimonials page to see for yourself. 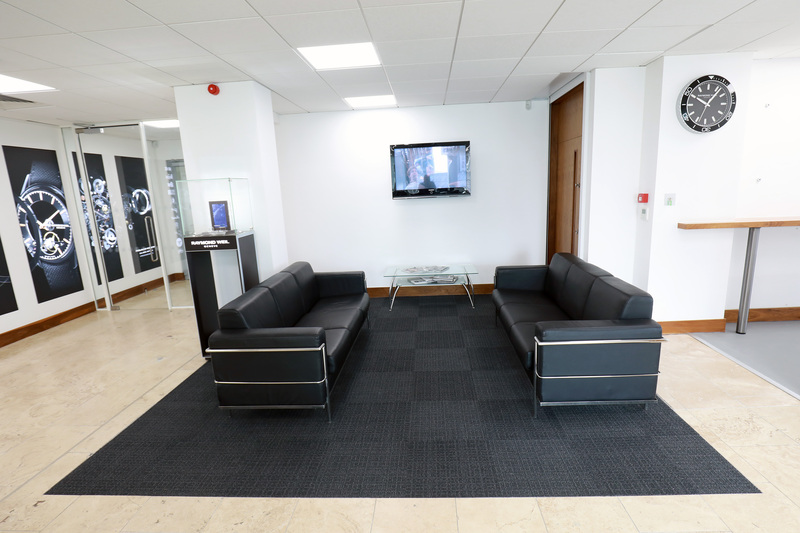 Here is a reception area that we planned for Ai Process Systems showing the individual stages of the reception area planning we undertook. 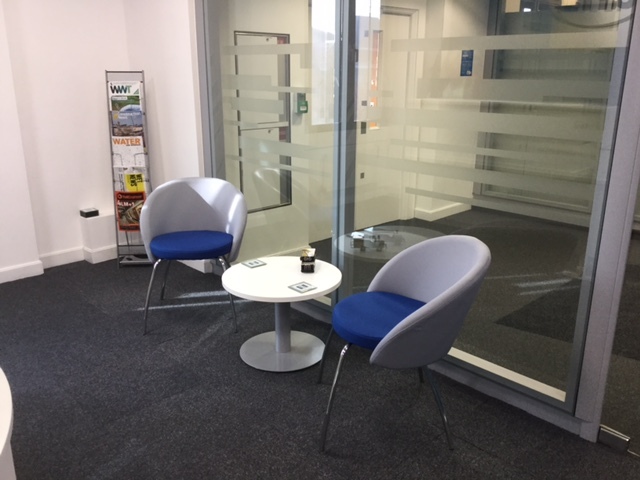 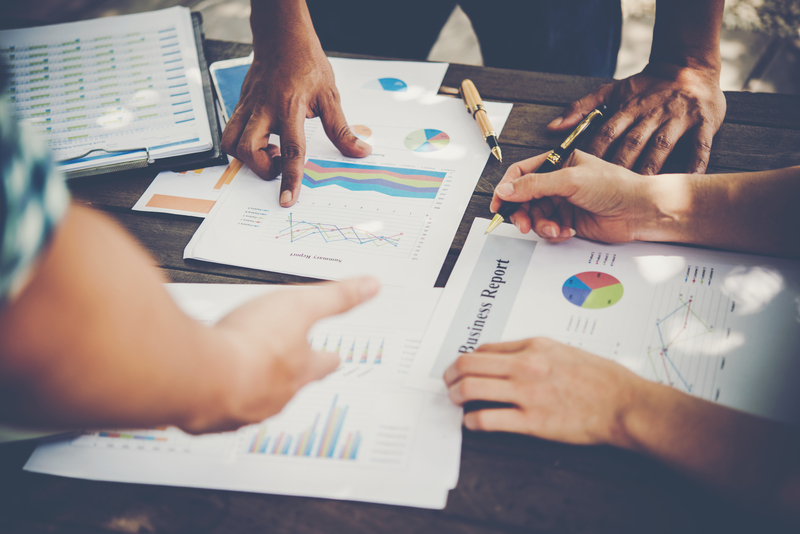 First of all our sales representative spent time with the client to round up their ideas and making sure to take note of exactly what they want. 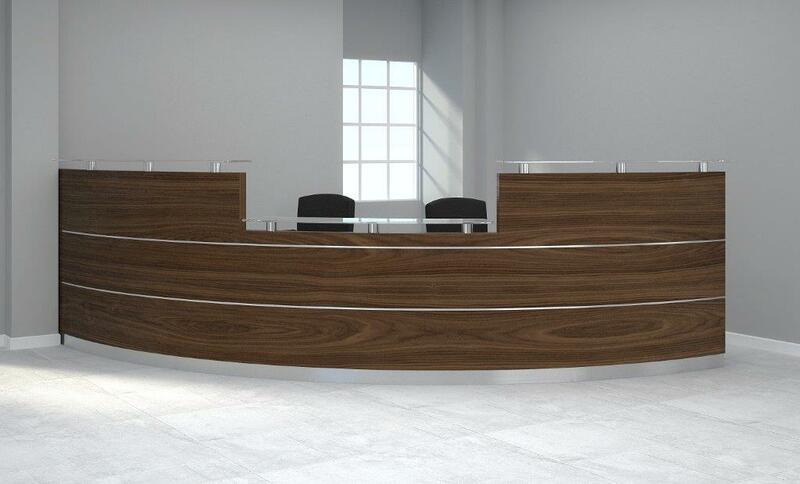 Then the planning commences with our free CAD drawings which you can see in picture 1, using a curved reception desk utilise the corner of the space as a focal point. 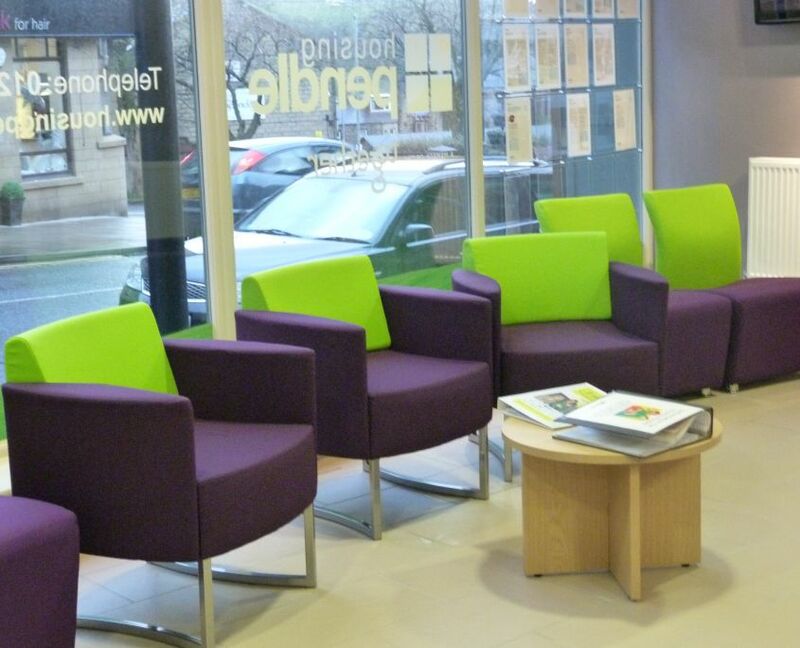 Once the client had chosen their desired look the render was created to show how the reception area would look. 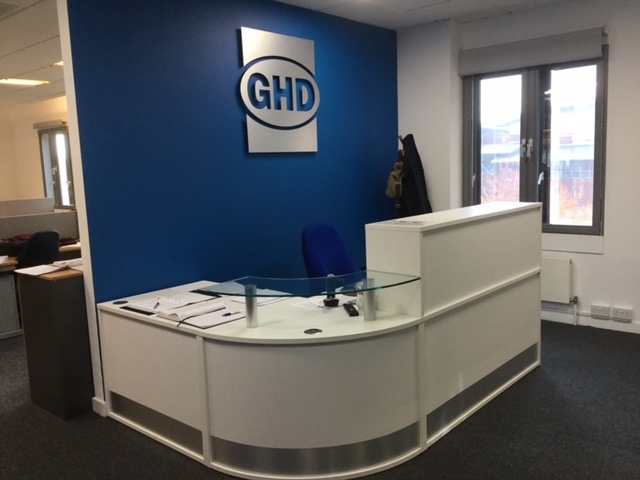 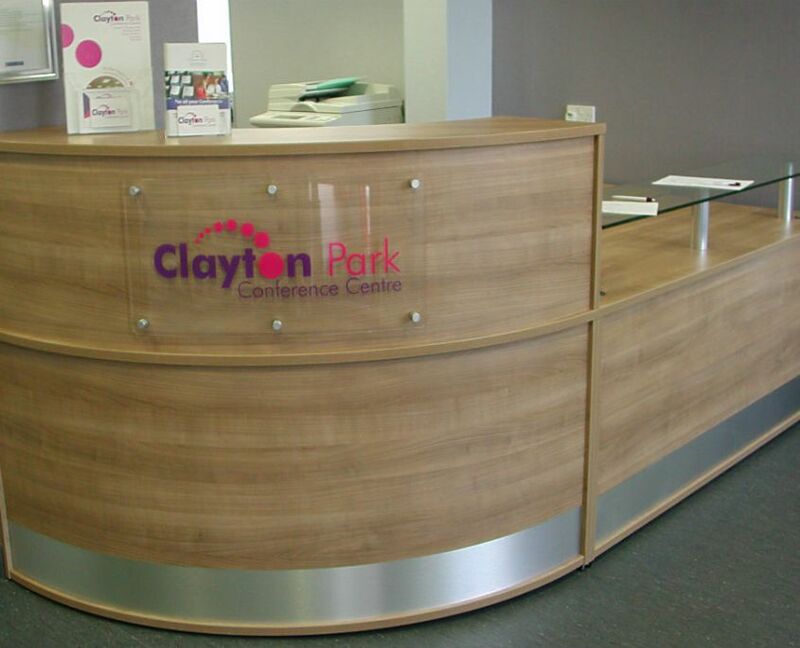 The end picture is finished reception area which was a bespoke walnut veneer reception desk with glass shelves – an executive look, a great focal point for their customers. 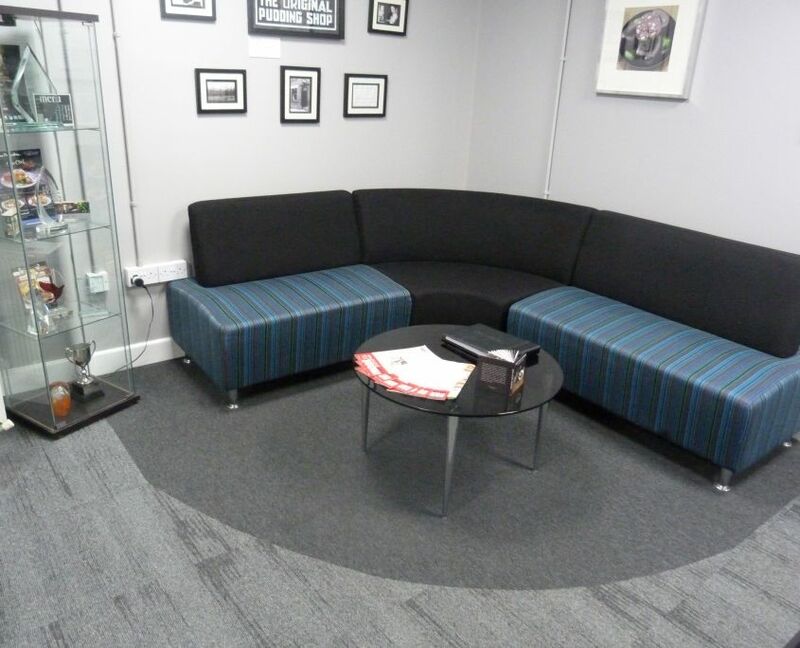 Some receptions we have done..
We don’t just offer this service for reception area planning we can also do the exact same for your office furniture, boardroom furniture, meeting room furniture, training room furniture and breakout area. 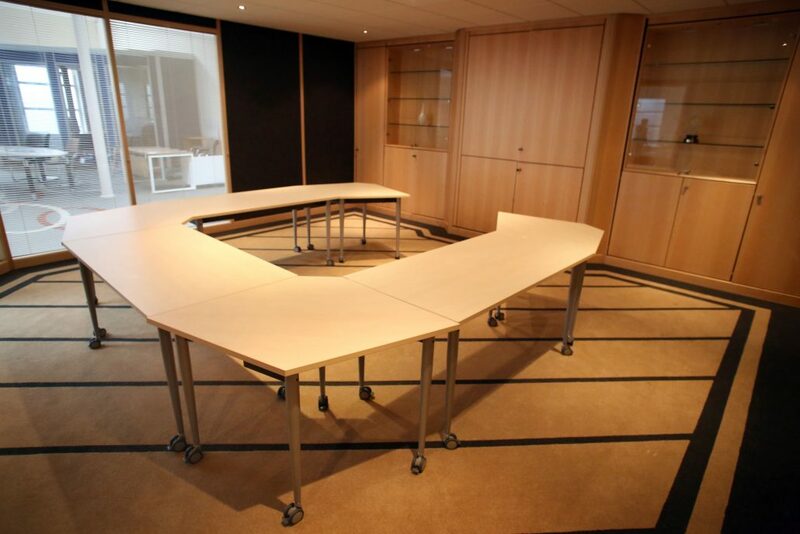 Below is an example of a boardroom area we planned for Albany Products which included a bespoke boardroom table, executive curved desk and a huge credenza unit. 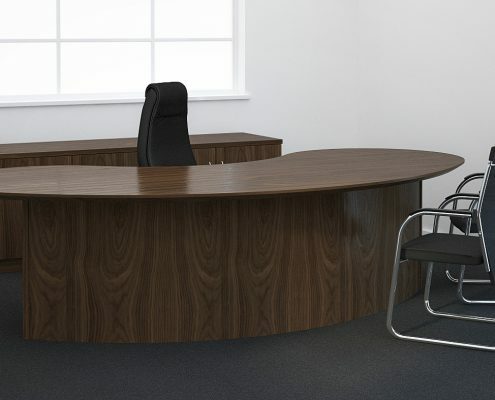 As you can see we planned the office first with our CAD drawings service, then we produced renders to see the boardroom furniture as it would look in situ and then the final project finished and looking amazing. 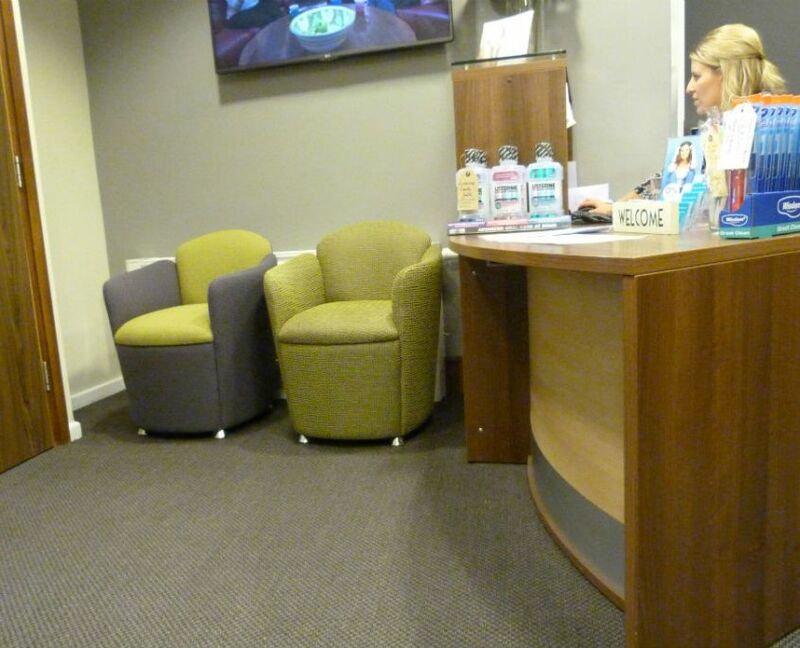 Our service doesn’t just stop there. 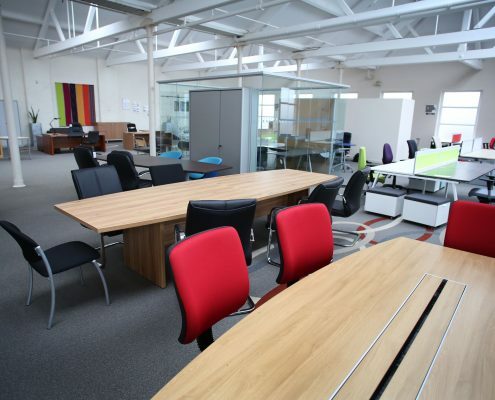 We give endless options on the amounts of furniture that will work in your office space. 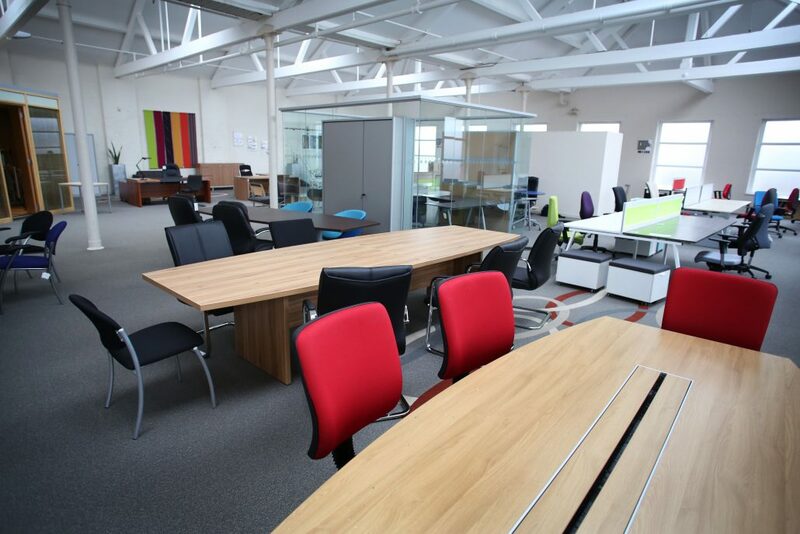 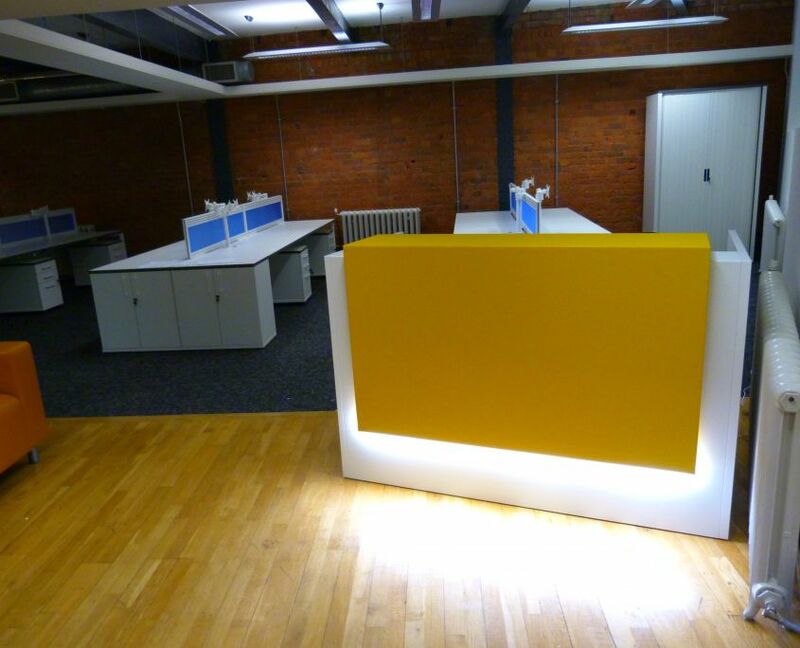 We will suggest fabrics, wood finishes and colours that will look well and even match with your company brand. 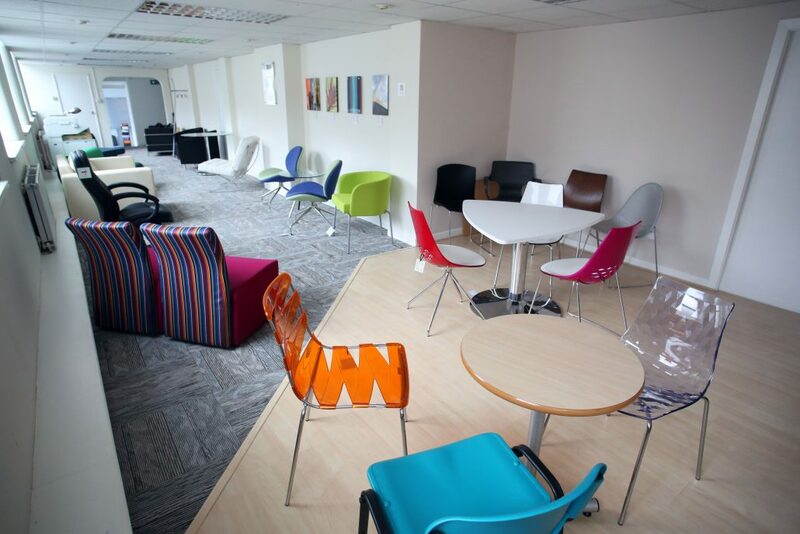 We have that many options on chairs, desks and screens that we never limit you to what we like, it is about your office space and what you want. 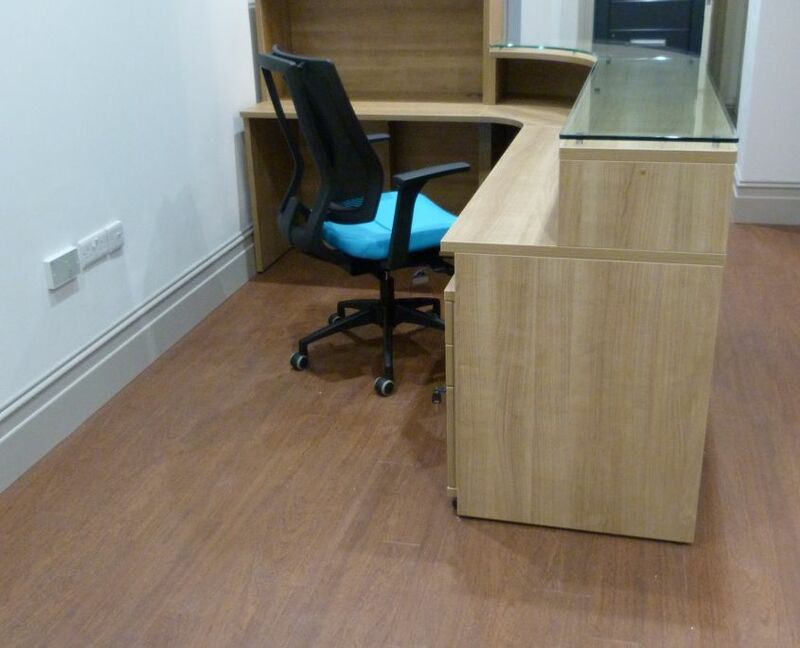 This all being able to view in our 10,000 sq ft office showroom in Rishton, Blackburn, Lancashire. 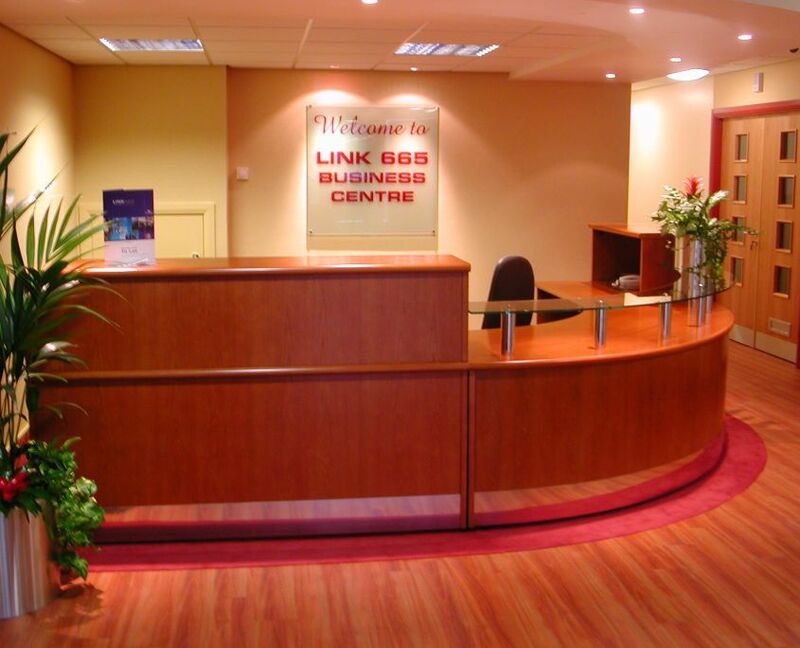 See our contact page for the full address.